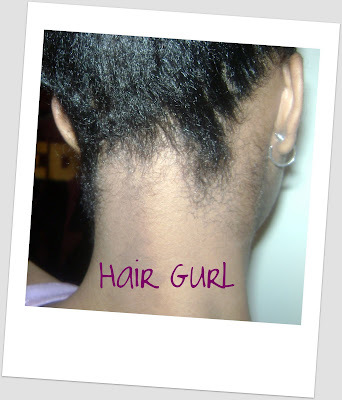 KenyaGurl: How To Grow Your Nape aka "Kitchen"
Have you ever wondered where the term kitchen came from? Apparently, it derives from African American women and little girls getting their hair done in the kitchen. I can vouch for this because it was in the kitchen where my mother would straighten my hair with a hot comb. She needed to be near the stove for the hot comb. My nape or kitchen was the toughest part to straighten and I had the burns to prove it. Ha! I've been growing my hair for a little over 2 years and I've learned how to grow my nape long just like the rest of my hair. Same rules-just apply it to your nape! Here are some things that are helping me grow my nape longer and stronger! 1. Wash the scalp & hair in your nape. This area can be easily neglected while washing your hair. Remember to wash the scalp & hair in this area to create a clean growing environment! 5. Don't add unnecessary tension to this area. No TIGHT PONYTAILS. Tension pulls the hair and this leads to the hair breaking off in that area. *raises hand* I'm was guilty of doing this in past! 6. Cover the nape with a silk or satin scarf before bed. Now I realize you may not be able to cover the entire nape, but that's okay. Just make sure you are covering the majority of it. What tips have helped you grow your nape? It's always great to learn more. :-) Let's give our nape the attention it deserves! Perfect just what I needed to know. I've always had problems with my kitchen with breakage everything you say makes sense and so true. Thanks! Thanks for this post. I have always been told to cut this portion of my hair off. And I did. But now since i'm going natural, I like my hair the way it grows and I want to keep my nape hair but since I always had to cut it, I felt uncomfortable letting it grow. But since i've found this post, it has given me confidence that I can grow my hair back there and it can be healthy and manageable like the rest of my hair. Thanks for sharing this information.